In previous articles we looked at how the digital technologies of our modern world are affecting us physically and emotionally and now we come to their psychological impact. On each level; physical, emotional and psychological the affects are pervasive and widespread but perhaps their impact on our mind space is in most urgent need of our consideration. Personally, I think there are few things as gratifying in all of these techno capabilities as the freedom and accessibility of information. To be able to simply click into a page, type a few words in a search engine and instantly come up with a whole list of possible answers to our question or information requirement is truly something of a wonder and it was not there just a few short decades ago. Instant information, instant access to libraries, archives, books, knowledge of every kind, videos, you name it, it is now all accessible through the technologies that so many of us are enjoying in the privacy and comfort of our own homes. Anything at all can be googled or typed into whatever search engine we like to use and a list of responses immediately pop up on our computer screens. The information age has well and truly dawned and in many ways it is amazing and it is incredibly useful and potentially liberating. I have certainly put these technologies to good use in recent years as have lots and lots of other people. We have created an engrossing cyber world, with many possibilities suddenly available to all and sundry and ordinary people are finding that they are spending more and more time in front of their screens. With the increase of information available on all fronts how do we discern what is really helpful or not? Our ability to discriminate and make good and informed choices becomes crucial when there is so much information available. Whoever it was who said information is power certainly hit the nail on the head. Information is indeed power and on one level this can be incredibly liberating. But there is always a flip-side too. So much information is so readily available to us instantaneously that we can quickly feel a bit overwhelmed. There is a sensory overload that can happen. Certainly there is a point when too much information is, well, just too much. When the mind is always preoccupied and busy, it can bring on a sense of disconnection and dis-orientation. Unless we monitor our time on the net more closely and work in a structured, planned way with clear objectives and time deadlines, we risk being gobbled up by the sheer mass of information and interesting stuff’ that is freely and easily available. There ar also other issues which are beginning to emerge as people start to spend more and more time on, for instance, their smart phones. In a very short time, these devices have become not only common place, but indispensable to many, many people. We see a whole new form of addiction emerging. The addiction of needing to be constantly validated, the addiction of needing to be constantly engaged, constantly pre-occupied. Have you ever noticed how many times you are reaching for your phone during the day, checking this, responding to that? The mind is almost feverishly searching out new stimulation almost all of the time and our smart phones can deliver it. This incessant engagement can, and is, in turn leading to higher levels of anxiety. There is a compulsiveness in the way that many of us now use our smart phones. When we are separated from our devices, or if we find ourselves outside a wifi or connectivity area a whole different kind of anxiety kicks in. A separation anxiety. It can also be noted that a new form of depression is arising from the over use of certain digital technologies which are ushering in a whole new set of obsessions along with their concurrant psychological repercussions. There are also emerging issues arising as we try and keep up with the plethora of updates and developments and breaking news and such. We find that new skills need to be developed to help us cope with the sheer volume and input of on-line information and networking. Multi-tasking is one of these modern day skills. Now we find we are learning to do two or more tasks at the same time. Might we be spreading ourselves a bit thin? How well is any of us really able to multi task? There is also the question as to what happens if we are separated from this technology for one reason or another? There are numerous reasons as to why this could happen. Amid all this melee how do we reclaim a much needed point of balance? There is always a fine line at the cross over of, too much. We need to become more alert so as not to be swallowed up. The beauty is, of course, that we can choose when to stop. By becoming aware of the pitfalls and knowing how and when to halt we can regain our control and balance but this requires wisdom in action and a conscious decision. While we are creating progressively more complex systems of thought which in turn are creating more and more complex lives we have yet to understand how to negotiate and unravel all of this complexity in a satisfactory way. There are so many interesting things on the internet. We can easily become distracted and go off on numerous fascinating tangents and all the while our lives are slipping by. There is nothing the least bit complex about that fact. If we are to bury ourselves in this technology what is there to show for it when our mortality finally rises up to claim us? Take, for instance, those who are into gaming and escapism, who log in to chat rooms and blog carnivals and so on and so forth. Whole days of their lives are spent engrossed in these pursuits. I stayed a few months at a friends flat in Sydney a while ago and her brother, who was unemployed at the time, was visiting. He spent the whole day and well into the night playing games on the net. He was phenomenal, he barely moved from his seat for hours at a time. That someone should be riveted to little moving dots on a screen for such long periods and with such concentrated intent was actually quite disturbing to see. We also have privacy and surveillance issues which can have widespread and profound effects on our psychological well being. Although one can certainly be anonymous on the web, it is becoming more challenging to remain so. The social media accounts that many people now use, link into so many other areas and now one can simply login using a Facebook, Twitter or Google+ account. This is something I personally find rather insidious. If i want to join a class or study some thing I may not want the whole world to know about it and yet we begin to find that some courses can only be joined via one of these services! But of course the surveillance issue is not just confined to the internet, almost everywhere we go, almost everything we buy and increasingly almost everything we do is recorded in some way or another. The spectre of Big Brother is very much alive and peering over both our shoulders. So here we are, on the one hand we have all this new freedom in the form of information which is easily accessible and available 24/7, but on the other hand this very same technology is moving into our lives in ever more invasive ways. As the technologies become more sophisticated so too are the manner in which they are impacting us. Artificial intelligence is no longer something which exists only in the realm of science fiction movies. Its out there and there are all manner of pressing and challenging ethical issues to be considered in to regards to its increasing use. Often it appears that these issues are only ever really tackled when they become problems and this brings us in a full circle. If every spare moment of our waking day is spent with our attention pulled towards some device or other, what impact is that likely to have on our natural sense of inner peace and happiness? Is there any stability to be found in something which routinely throws us right out of our point of balance? The most pressing need for all of us is to consider how we move forward with the new technologies. They are unlikely to go away because in so many ways they are useful to us. Yet we can be quickly consumed and we might not even be fully aware of it. There is always a fine line between using the tools that are supposed to make our lives easier and being overrun by those very same tools. There can be no doubt that we have entered the age of useful technology but where do we draw the line between useful and invasive? When does something shift from being helpful and useful to being invasive and controlling? Discrimination becomes extremely important when looking at the possible effects of modern digital technologies on the way we work, live, communicate and function. We only have so much time in our day and being disciplined enough to use that time wisely is a very real issue that many of us need to look at carefully. With all kinds of information available at the mere touch of a button, we potentially open ourselves to a world of mental engagement that leaves little or no room for inner space. The psychological impact of an information overload can lead towidespread dissipation, fatigue and confusion. Cyber technologies begin to blur the lines between what is real and what is not. 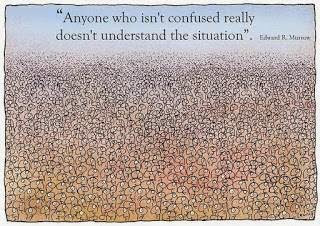 I think Leunig’s cartoon captures the spirit of the current situation rather pithily. Is it time to start asking ourselves how much is too much? Each of us has to consider and decide this for him and her self. Thankfully we do have these choices. They require a step in consciousness and discrimination. Who among us would loose out by developing these skills of awareness and discrimination when it comes to our use of digital technologies? The pram already has the baby in it and it is rolling down the hill. Only we can catch hold of it before it gains too much momentum. Very soon, even this may elude us.‘Anyone who isn’t confused, really doesn’t understand the situation. Time to take stock, time to become aware.